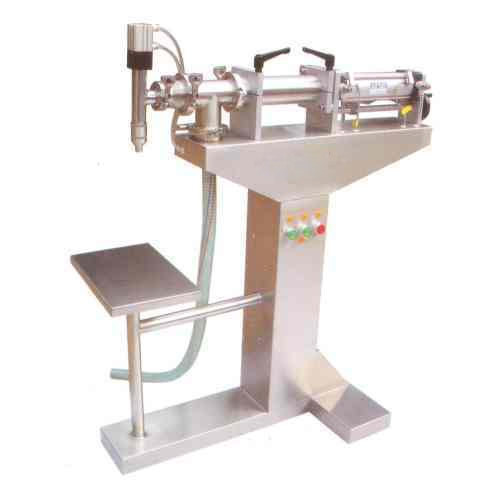 To meet diverse requirements of our prestigious clients, we are engaged in providing an excellent range of Liquid Filling Machine that is used divers processing industries. Only high-quality components are used while manufacturing the offered range, for increased compliance with industry standards of quality by our experts. The offered machine is highly appreciated among clients for their high performance and compact design. Apart from this, our range is offered in different specifications and can be customized, as per precise needs of our clients and at highly competitive prices. Established in the year 2000, in Noida (Uttar Pradesh, India), we “S. G. Packaging & Coding Co.” are the reckoned Manufacturer and Trader of supreme quality Automatic Pouch Packaging Machines, Belt Conveyors, Z type Bucket Elevators, Screw Conveyors, Forming Tube Collars, Auger Screws, Rewinder Machines, Auger Filler Machines,, Mixer Machines, Ribbon Blender Machines, Weigher Filling Machines, Roasting Machines , Conveyor System , Fryer system , wire mess conveyor , Trough conveyor , Modular conveyor , and many more. The offered machines are manufactured using high-grade components and modular machines in adherence to set industry norms. Our offered machines are widely used in various industries for packing products safely for safer transit. We have with us a sophisticated infrastructural base unit that is spread over a large area of land and is equipped with advanced machinery, equipment, and technology. This unit is segregated into various departments like manufacturing, quality testing, packaging, sales, and marketing, etc. All these units are handled by our skilled and experienced professionals. Our professionals are cable enough to fulfill an exact requirement of our clients within stipulated time-frame. Utilizing their rich industrial knowledge and hard work, we are able to carry out entire business process in the planned manner. As a quality-oriented organization, we are focused to fulfill the exact requirements of our clients within predetermined time-frame. Our all work processing units are supervision by our skilled “Mr. Mahendra Singh (Proprietor)”. His sharp business acumen and business developing thoughts inspire our professionals to work with determination and unity. In order to attain maximum client contentment, our professionals follow ethical business policies and make transparent dealings with the clients. Due to our client-centric organization and quality oriented policies, we are able to maintain a reputed position in the market.